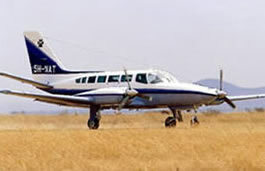 From the Wilson Airport, fly over the Athi Plains into the bushy country of Amboseli National Park. Amboseli is a landscape dominated everywhere by the glistening, majestic snowcap of the mighty Mt. Kilimanjaro - a fitting backdrop to the wild region. Dinner & overnight is at one of the Amboseli Lodges, located in the very heart of the Amboseli National Park. An early morning game drive followed by breakfast and then transfer to the airstrip for the return flight to Nairobi. Depart from the Wilson Airport for a spectacular flight over the dramatic Great Rift valley and on to the Masai Mara - the unspoilt savannah that shares with the legendary Serengeti. An early evening game drive to absorb the vastness of Mara and to view the largest population of lions in Kenya as well as the great variety of large beasts like Buffalo, Black Rhino and Hippopotamus. Other mammals to be found in the Mara include Leopard, Cheetah, Common Zebra, Coke's Hartebesst, White-bearded Gnu, Oribi, Warthog, and Thomson's and Grant's gazelles. The bird life of the Mara is as profuse as its mammalian fauna. All meals and overnight at an archetypal Mara Lodge/tented camp. An early morning flight, skirting the twin peaks of Mt. Kenya to Samburu. An early morning game drive to view game exclusive to this region like : Reticulated Giraffe, Grevy's Zebra, Beisa Oryx and the Blue-necked Somali Ostrich. Meals and overnight at one of the luxurious Samburu lodges.